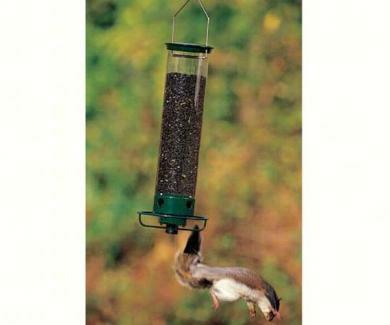 Outwit the squirrels by squirrel proofing your bird feeder. Tips to keep pesky squirrels out of your bird feeder. Next, install a squirrel baffle above your feeder. Your squirrel baffle can be made from a steel garbage can lid or pie pan OR you can buy a store bought squirrel baffle which will be more pleasing to look at and more functional. 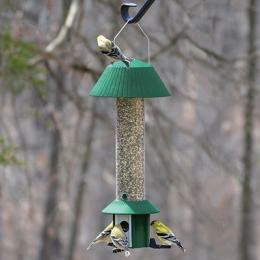 You can also suspend your bird feeders between two poles or trees with heavy duty nylon string or fishing line. Plastic PVC pipe can be placed on both end of the nylon string to make it more difficult for a squirrel to get to the feeder. They will spin and flip trying to get to the feeder. Pie pans can also be strung on the line as well to give the squirrel more obstacles to deal with. 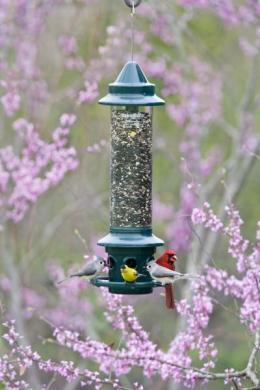 A pole mounted birdfeeder should be at least 6 feet above the ground so that a squirrel can't leap up onto the feeder. Locate the top of your pole mounted squirrel baffle at least 5 feet above the ground when attaching it to the mounting pole. When the squirrel goes up the pole, the baffle will literally baffle the squirrel and he will turn around and head back down the pole and considers his next move. Some suggest greasing the pole with Pam etc. but this will work for a short period of time only. The other option is to divert the squirrels away from your bird feeder with a squirrel feeder or squirrel toy in some other part of your yard. Several manufactureres make squirrel feeders that spin with cobs of corn on the end. when the squirrel jumps for the corn cob, the squirrel spins off to the ground. You can also use an open platform feeder type tray (a flat tray) and provide a feeding area for the squirrels with cracked corn, an inexpensive seed, or another type of food such as sunflower seed or peanuts. The idea is to place this feeder in another area as a diversion so that the squirrels do not bother the other feeders that are provided for the birds. 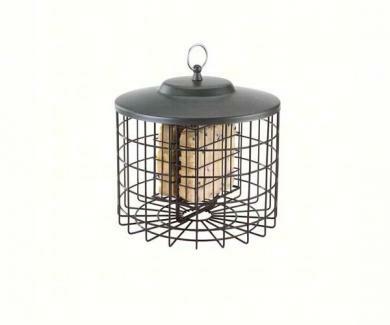 Check out these excellent squirrel proof bird feeders that may eliminate all of the above.